No prior experience with HDLs and FPGA workflows is assumed, but some programming experience and an understanding of basic digital electronics is required. There are no future events currently planned. 6-8 September 2017. Hebden Bridge Town Hall, Hebden Bridge (UK). Held as part of the Wuthering Bytes Festival and sponsored by the BCS Open Source Specialist Group and Computer Conservation Society. This event adopted the newer Mystorm FPGA development board. More details of this particular event can be found on the ChipHack/EDSAC Challenge page. 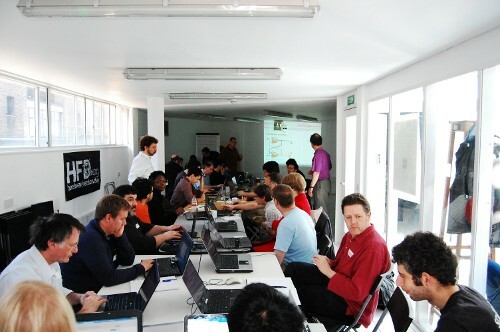 Anyone can organise a ChipHack event and this is encouraged. All the materials are freely available. The organising team will need to have some Verilog/FPGA experience. A set of MyStorm boards are held by the BCS Open Source Specialist Group, and can be borrowed for appropriate UK events. The materials and supporting workshop notes were originally developed for the first ever ChipHack event and have been updated since. All the source materials can be found on the GitHub chiphack repository and wiki. Note that these are under development, so may not be entirely suitable for unsupported use. Some of the slide decks are prepared using Hieroglyph, and can be viewed directly on this website as either HTML pages or slides. Others are provided as plain PDF. Martin Campbell-Kelly on the history of EDSAC: part 1 PDF. Martin Campbell-Kelly on the history of EDSAC: part 2 PDF. Bill Purvis's EDSAC in Verilog PDF. Recreating EDSAC peripherals html, slides. Hatim Kanchwala's EDSAC design html, slides. Kevin Murrell on the EDSAC replica project PDF. Logo based on a drawing by ZyMOS, CC BY-SA 3.0. Hosted on GitHub Pages — Theme by orderedlist.